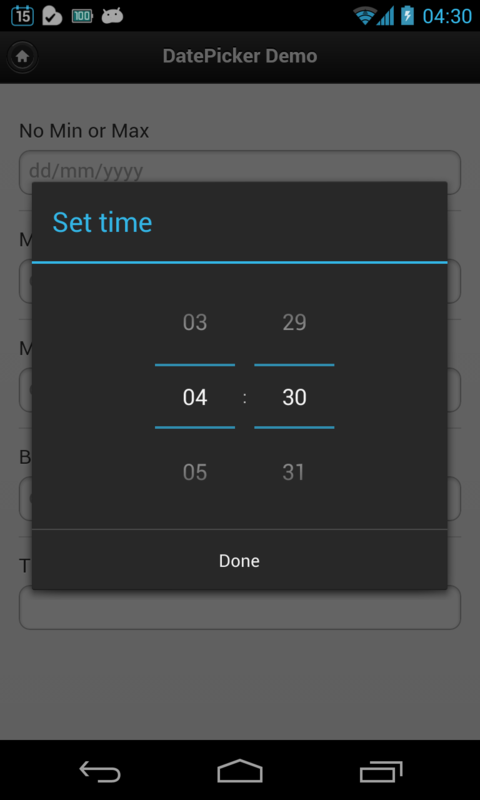 A Better Android DatePicker Plug-in for Cordova – The "Not so Useful Blog!" You cannot set Minimum and/or Maximum Date in DatePicker. So, if there’s specific need to have date range, this plugin certainly fails to provide proper solution. It happens on all Android OSes. 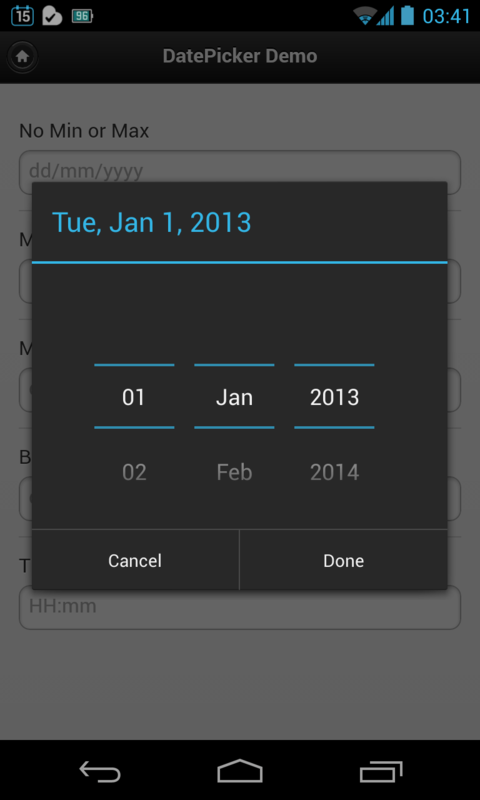 On Android OS > 4.0, the DatePicker loses Cancel button. I checked and this issue is with Android ICS itself, but it would be nice to have that button just in case user don’t want to enter anything once DatePicker is popped open. Also on Android OS > 4.0, user is no really required to press done to set date. Any action performed like clicking hardware back, or clicking outside the DatePicker pop-up, results in selection of date. Again this is default feature to ICS versions but definitely it’s a bad User Experience. I searched over various StackOverflow threads but none of them were able to solve these issues completely, though in parts some of the issues were solved. So, I decided to create my own plugin. Of course, I’ve taken the existing plugin and created my own. You can find revised plugin at my GitHub page. This plugin solves all three issues I’ve mentioned. 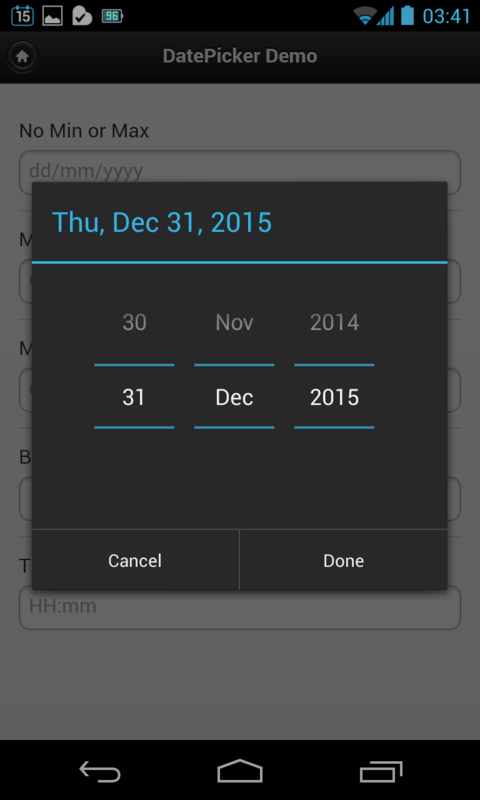 You can set Minimum and Maximum date on DatePicker, and this works on all Android OSes. Cancel button is now present in DatePicker – something which is improvement over stock DatePicker. Clicking outside the DatePicker will do nothing, neither closes the pop-up nor update the date. Hardware Back button will not update the date as well. Again this is UX improvement over stock DatePicker. Found any bugs or have any suggestions? Create an issue over GitHub issues page.